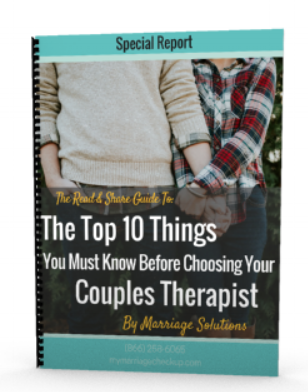 It has been my pleasure to create various tools for you to implement throughout the healing process that will aide you in couples therapy and marriage counseling. Brad and I founded Marriage Solutions because we are passionate about helping couples find the connection they deserve in their relationship. It has been my pleasure to create various tools for you to implement throughout the healing process that will aide you in counseling. You will find the free online orientation to counseling very useful to prepare you to make the most out of your counseling experience. You can find the free online orientation by clicking here. Also, I write many of the blog articles along with Brad as well. You can connect with us on Facebook by clicking here. I also produce the podcasts we offer. You will find our podcast called Healing Broken Trust in iTunes, Stitcher Radio, and Soundcloud. I really enjoy seeing lives changed for the better. I used to talk to every single client on the phone before they booked their appointment and it was always such a pleasure to hear and see their transformation in such a short amount of time. In my personal life, I have watched my parents struggle in their marriage and I see how personal trauma can rob you of your happiness. Whether it's trauma in your marriage or in your past. It is so hard to have a meaningful relationship when those closest to you like your mom or dad hurt you, abuse you, or disowned you. It makes it very hard to trust that your partner could possibly love you or care about you when your mom or dad don't. I watch those children who grow up to be adults and find themselves met with romance make their way to our offices and everything in me celebrates. It takes courage and strength...I know because I've had to work on this for myself. I see how hard it is to let someone into the vulnerable places in our hearts because I have been that person. I have experienced first hand the fear of letting your spouse close to you because, "what if they see the real me and hate it?". The fear of rejection and not being good enough keeps many of us from experiencing the love we so desperately crave. Because for me I want everyone to be able to really experience deep meaningful intimacy with the person they love the most. I have found it with Brad after a lifetime of sadness and feelings of rejection. I know it's possible and I want it for you more than almost anything. When I could let the acceptance and love of my spouse into my heart and could be more vulnerable I felt like I came out of the darkness of sadness and hurt and into the lightness of love and acceptance. I could be more of myself. I discovered things about myself that I never knew were a part of me. Things like I actually have a sense of humor. I felt more confident to take risks and I enjoy little things that I used to over look. Unconditional love and acceptance is what I want you to feel. I want you to understand what it's like to be your best self. The way that happens is by experiencing the deep satisfaction of true love with your spouse.